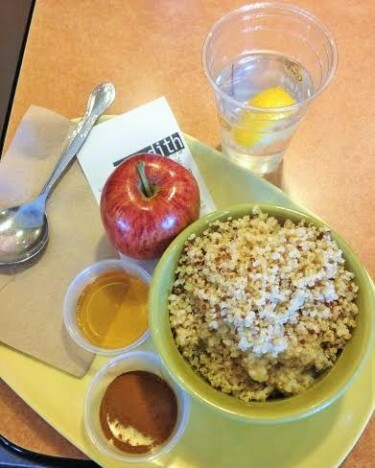 Recently I tried Panera’s Power Almond Quinoa Oatmeal. Honey and Cinnamon on the side; I wish they had peanut butter, it needed peanut butter! I ordered the oatmeal without the almonds because I am allergic to almonds, especially in their raw form. And that red apple you see on the side of the tray? I am allergic to that type of apple too which I sort of knew but the oatmeal really needed flavor so I figured I would try to eat it by dicing it up and mixing it in with everything else.. Within one spoonful of the apple in the oatmeal though, my mouth felt weird and my chest was heavy. 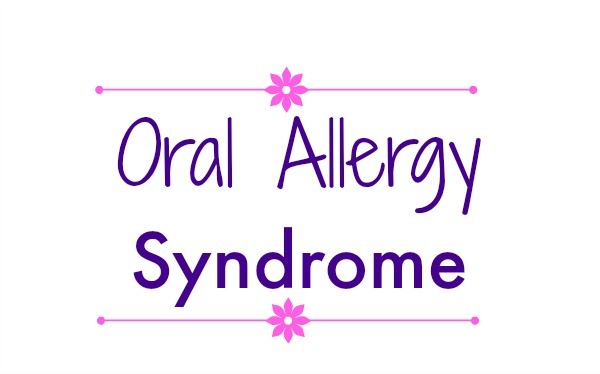 I have something called Oral Allergy Syndrome (OAS) which I described in detail in a great post last year. It is still one of my most viewed posts and a top search engine result for me too so if you missed it, I recommend you read it. Without going into all of the details again since that post really does a fantastic job of doing so, Oral Allergy Syndrome is a type of food allergy classified by a cluster of allergic reactions in the mouth in response to eating certain fresh fruits, nuts and vegetables. While it is not considered a life-threatening anaphylactic allergy, it can be, although rare, especially when it comes to the nuts spectrum of OAS. I know you see me eating apples all of the time but the truth is, I am in fact allergic to apples. I cannot eat red or golden delicious apples at all and probably shouldn’t eat any apple variety in its raw form BUT I can for the most part tolerate (and enjoy) my favorite granny smith and pink lady varieties. Sometimes, I can’t though, at least not without my mouth itching, my chest getting heavy and overall feeling weird. It’s an interesting allergy because sometimes it’s there and sometimes it isn’t. Sometimes my symptoms are itching, something they are swelling and sometimes I feel like I can’t breathe even though I can breathe. Because the allergenic proteins associated with OAS are usually destroyed by cooking, most reactions are caused by eating raw foods. The main exceptions to this are celery and nuts, which may cause reactions even after being cooked. Since the allergy is related to the cross-reactivity of pollen found fruits, vegetables and nuts, for years I took Zyrtec on a daily basis just so I could continue to eat what I wanted without a reaction. This method of mine worked most of the time, except when it came to raw cherries and nuts (peanuts, almonds, walnuts and really any nut actually) affecting me not in a life-threatening way, just in a I don’t feel well, this really isn’t smart of me to eat foods I am sensitive to sort of way. Recently however, I decided to stop Zyrtec cold turkey just because I didn’t want to be dependent on a medication. I learned something interesting once I started living allergy medicine free…. 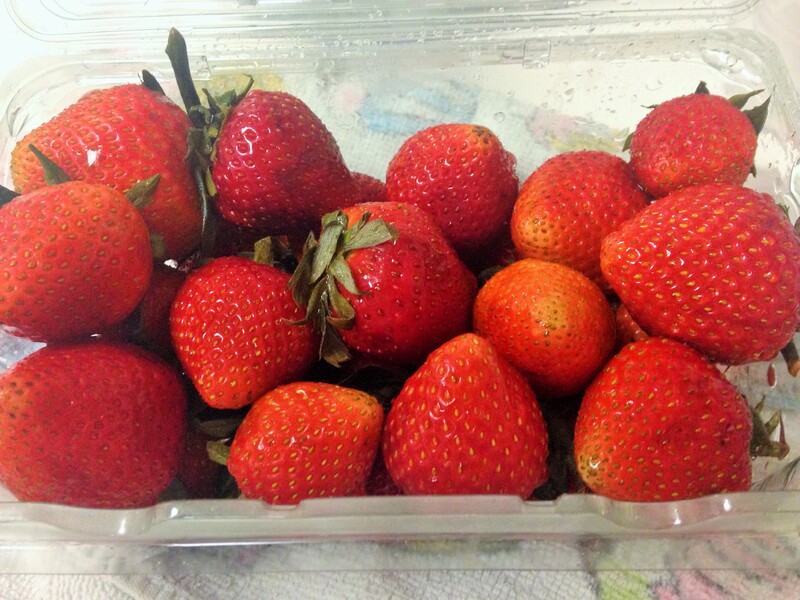 I am allergic to strawberries. I had no idea I was allergic to strawberries because I had been on Zyrtec for so long that so many fruits and vegetables that I didn’t eat years ago I do eat now which meant that taking Zyrtec completely masked some of my food allergies! Or, they do say that as we get older, we can develop more allergies which is the case for me when it comes to pineapple. I can no longer eat more than one piece of pineapple without my mouth being attacked and my tongue turning bright red! Within a week of stopping Zyrtec, I ate some strawberries and my mouth was itching, my chest was heavy, throat felt weird…. This can’t be! Please say it isn’t so! But it is so. Trust me. I kept trying to make it not so yet each time I ate more than one plain berry, my mouth reacted and even produced blisters. I had three containers of fresh strawberries in the house and there was no way my son was going to eat them all before they would go bad. Since cooking or freezing the berries will alter them enough to eliminate the allergy, I went with baking since I hate frozen strawberries! 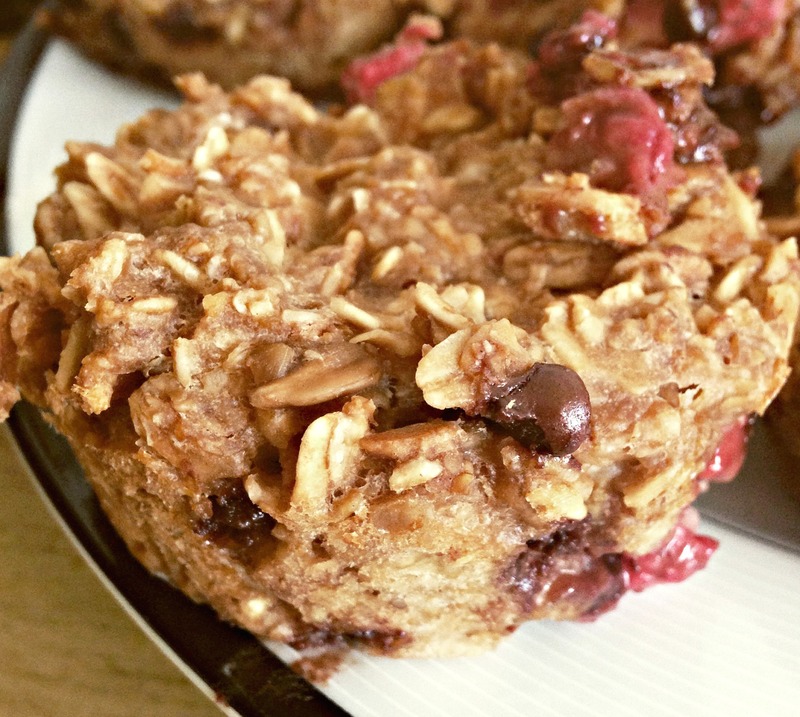 I created these chocolate chip strawberry granola muffins using a combination of old-fashioned rolled oats and Love Grown Foods Cocoa Clusters. The chocolate taste of the clusters (which is like a granola) is a winning flavor combination with the strawberries and the texture of the muffins is dense and hearty with a nice chew to every bite. Of course I added peanut butter. I can’t eat raw peanuts without my chest and throat getting heavy but I can thankfully eat peanut butter which makes it all okay. In a bowl, mix together mashed banana, milk and peanut butter. Add in the oats, Cocoa Clusters and baking powder. Mix until well combined. Mix in strawberries and then stir in chocolate chips. Lightly grease muffin pan and fill each muffin cup a little over half way with batter. Bake for 20 minutes or until the tops are slightly brown and springy to the touch. Store muffins in an air-tight container (they will last longer if stored in the refrigerator). Are you allergic to certain foods now as an adult that you weren’t as a kid? Is it just me or are frozen strawberries just awful?! I really never knew I was allergic to them but I guess that’s because I never really ate them until a few years ago. I was the pickiest of eaters growing up! Such a bittersweet post–I’m allergic but here’s how to use it! And they sound so good! Ha. Well since I cooked the berries in the muffins, I seem to be able to eat them since cooking the fruit makes the allergy go away (most of the time). These look yummy! 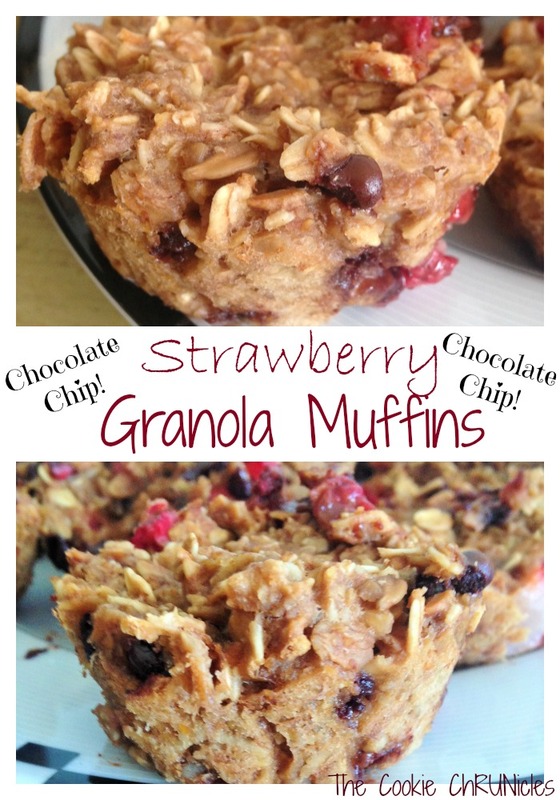 I really need to try adding granola to my muffins. I have used granola in baking several times and always like how it comes out! Let me know if you try it. No allergies for me but I know people with them. Strawberries and apples are pretty common, I know strawberries used to make my sister break out in hives! You made a good call to put the strawberries to good use though 🙂 I use frozen strawberries in my kids’ smoothies but that’s it, I don’t even know what they taste like! We go through tons of strawberries here, a huge favorite. My son loves strawberries too. Thankfully he doesn’t have my food allergies! The flavor combo in the recipe sounds awesome! I am sorry about your new found allergy. I am not allergic to anything and I only can imagine how hard it is to deal with. Luckily you can eat Peanut Butter! Can you imagine if I couldn’t eat peanut butter? I am totally with you! I am allergic to almonds, especially raw as well. Sometimes I will have a chocolate or cereal with almonds, since it’s usually cooked. Also allergic to chicken and green beans/peas. If I have em all together forget it, my tummy is super unhappy and my body goes in shut down mode. I am also a bit lactose intolerant but can handle some dairy here and there if it’s fatfree or reduced fat. I can usually eat things that have almonds somehow in the ingredients but if it is a first,second or third ingredient, I notice it! I stopped eating the cereals, granolas and kind bars that contain almond for this reason. Thankfully it doesn’t get life threatening on me if by accident I eat these foods but still, it’s annoying! Especially when everyone else can make things using almond milk. Sorry with the allergies – at least you can freeze or cook them and use them! In addition to gluten and nuts, I’m also allergic to oranges (and clementines, tangerines, grapefruits etc. ), avocadoes, and pineapple – and no amount of alteration will change that! I have oral foot in mouth syndrome. But seriously, I have something similar happen to me when I eat pineapple. Interesting! Also, I have a bunch of leftover granola that I need to use up. I’ll make these muffins this week sometime. Thanks! Let me know if you make them! They came out really good 🙂 I love pineapple but more than a piece or two and my mouth is not happy! Amanda @ .running with spoons. recently posted…. cinnamon roll sugar cookies . I keep wanting to have pineapple again to see if my allergy went away too because quite often with my food allergies, sometimes they are there and sometimes they aren’t. All depends upon the level of pollen in the food which is sometimes higher and sometimes lower. I have Oral Allergy Syndrome to blueberries, blackberries, raspberries and cranberries! It’s so weird because it just started happening a couple years ago out of nowhere! Thank goodness I’m okay with strawberries, I am definitely going to have to try your recipe! Oh wow, can you eat them when cooked or frozen? I am actually glad I can eat blueberries over strawberries. I like them both but I think I like blueberries better! I actually wonder if I can eat fresh blackberries and raspberries. I haven’t since stopping the zyrtec and the frozen don’t bother me. I guess I will know when I taste one! I can’t have them frozen, fresh or dried! It stinks because I love blueberries! My mom thinks it has a correlation to my birth control because it started when I started that, but the doctor said they haven’t heard of that before, but you never know! I can almost agree with her since I do think hormones alter our bodies which can happen during and after pregnancy so I can see the pill having an effect too. Or, sometimes, the allergies just come out of nowhere.